Home > Crystal Rarities + Oddities > Rock Crystals var. GWINDEL. ARKANSAS. 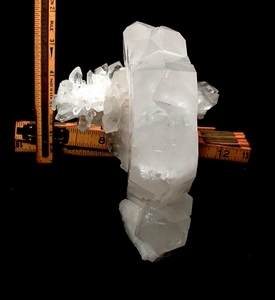 'Normally' and very rarely found in alpine regions of Switzerland, France and Russia, gwindel quartz is best described as a twisted stack of doubly-terminated crystals - and they're usually small. This quartz is from Arkansas, nearly the opposite of 'alpine', to be sure. And a bit over small as the center crystal is 7" tall. Overall, this spectacular tabular gwindel self-displays at 1-3/4" [to 5-1/2" of 'wing cluster']x 5-3/4"x 6". Such a celebrity, we had it verified. Some specs: read-through-clear areas; skeletal areas, preferentially frosted, perfectly translucent terminations boasting raised record keepers; wild rainbows and veils; elestial regrowth; a Dauphine twin; extra prism faces. Elestial and many many doubly-terminated 'wing' crystals; one 3/8" lost face and one, 1/8" flea bite. And a 2"x 2" penetrating bank of tabular crystals. A presence - a personality - which will command your attention without troubling to demand it. Safely stands/lays four ways for the prime space of your desk or cabinet. Each One The Only One.tm - Really.